She is just too cute. Gracie will be great company for you & your extended family. Gracie is a little sweetie. You are all going to have so much fun together! Lovely to see Gracie on your blog. My family and I are looking forward to regularly checking in on grace and see her progress. We are so happy your happy with her. 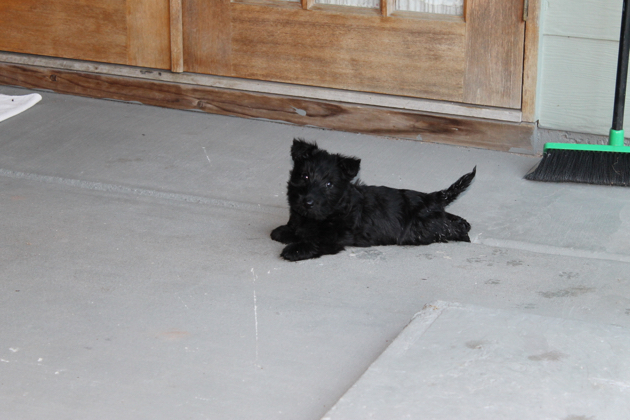 She's a gorgeous puppy and scotties are the best breed. Thanks for giving her a loving home. Hello Alannah (the breeder LOL) We're so happy with Gracie. She's obviously healthy, she's got such a sweet character and just the right amount of mischievousness. And you've socialised her perfectly - she really is a product of your large (in children and puppies) caring family. I couldn't be happier with her. Thank you. Well, them and Shelties, of course! We're so pleased you and Hanno are happy with her. Gracie and her siblings have been a labor of love for my family. What a gorgeous little pup, have fun! You know of course,Gracie has won our hearts. We will all be wanting lots of new pictures and will be barely able to wait for the next episode of "Watching Gracie Grow". Thanks for sharing her with us! She is a beautiful girl, wishing you so many happy years of love & fun (mischief too). I don't fee my girl commercial food either. She is so gorgeous Rhonda & Hanno & she couldn't have found a better home. I agree with you about dog food, I started making our 2 dogs food from your recipe a few years ago & they have never had tinned food since. When I took them to the vets a couple of months ago for their annual checkup the vet asked me what I feed them as the are in such great condition. Home made is definately the best. With our last dog, when we started cooking her food from real food (the recipe you posted years ago) Sadie's health improved, she lost her bloated look and her coat and skin looked great! Oh my! She's just adorable! I am with you on the homemade food. I've always made my own dog food and it couldn't be easier. Based on my vet's recommendations I mix up a batch every couple of weeks with baked chicken breast, rice, peas, carrots, sweet potato, and just a bit of olive oil. I also add crushed pet vitamins though I'm not convinced of the need for them. My girl is healthy and happy on this homemade diet. Best wishes as you settle in with this little bundle of fun! She's very cute. We use Black Hawk dry food for our dog (a Finnish Lapphund) on the advice of our very experienced breeder. Home cooked food can be good and I think this is combination with a nutritious dry dog food, bones to work on and homemade treats works really well. She's adorable! Congratulations!!! We are planning on getting a freezer and as soon as we can do that I will be buying chicks that are intended for meat birds and raise them myself. Then we will be cooking those up for ours dog's food, with rice and veggies we start growing in our garden. I have one dog that has skin problems, and it seems the better the food we give him, the less problems he has with his skin. I've got that book too Jaime, isn't it excellent? I was feeding our dogs a home cooked diet before I read Dr Billinghurst's book and once I read that I haven't looked back! Oh my goodness Rhonda, Gracie is just gorgeous! Enjoy your new found love. She is adorable, just the perfect combination, sweet and a little mischievous, have fun! She is very sweet - have your grandsons met her yet - they will be besotted. Our little dog will be ten next month and yet many people think she is still up a puppy when they meet her as she is full of beans She mainly has uncooked grass fed beef and a few dry biscuits, She also gets a bit of cooked chicken and fish and veg at times. Definitely a lot of dubious filler and too much salt in processed dog food. A raw diet is really the best way. I feed my cat a raw diet of minced meats bought from my vet and the diced chicken breasts I buy from a good supermarket here in the UK She also gets the occasional raw chicken wing in order for her to crunch the bone which is very good for dental health. What a sweetie pie! Enjoy. 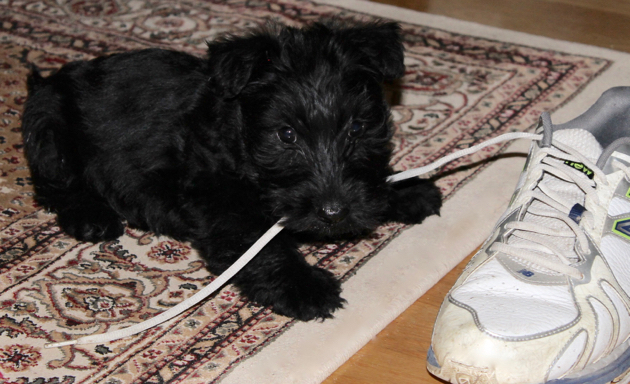 Oh, a sweet wee Scottie. That warms the cockles of my Scottish heart. Wishing you all many years together filled with laughter and fun. We´re a cat family but only because I´m not disciplined enough to follow a regime of regular walks - escept when we look after our son´s dogs. She's so adorable. I'm sure she'll bring you so much joy and friendship for many years to come. I cook up liver, kidney and heart as a treat for our dog who is a Cairn terrier, once a week, which I mix with vegetables. She just loves it and it's quiet inexpensive, as often people don't like to use these parts of an animal. It's a bit too rich for a young puppy's stomach, but now our dog is an adult, she wolfs it down. I'm hoping to get a dehydrator soon, so that I can make her natural dog treats (amongst other things of course), which should be fun. Gracie is adorable and I am sure you will enjoy her company so very much. There is nothing like the love of a dog. Thank you for the food links. I was a bit upset as I have been feeding our cats a premium food because one of them becomes sick when her diet is changed. It rated 3 stars. Now I am torn. Do I try her on another food and risk her bleeding or stay on the food that she is tolerating well. 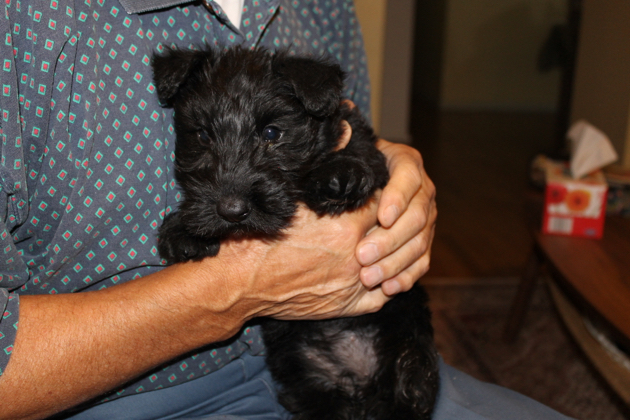 Little Gracie will bring you much joy and company. Terriers are a wonderful breed. Such characters they are. She will keep you laughing for sure. I am a dog lover and I just feel they complete a family. She is a darling. Enjoy her. What a cutie, I'm sure Gracie will bring you so much joy. Well done for feeding her home-cooked food. I've read about commercial foods and even the vet recommended ones...not fit for consumption! Congratulations! I like the thought of making her food in your own kitchen. This is something I plan to do when we become pet parents again. Can you share your chicken - rice recipe with us that you are feeding Gracie? She sure is a cute puppy, I don't know much about her breed. I have a Shetland Sheepdog who is very energetic and keeps me in line! Congratulations! 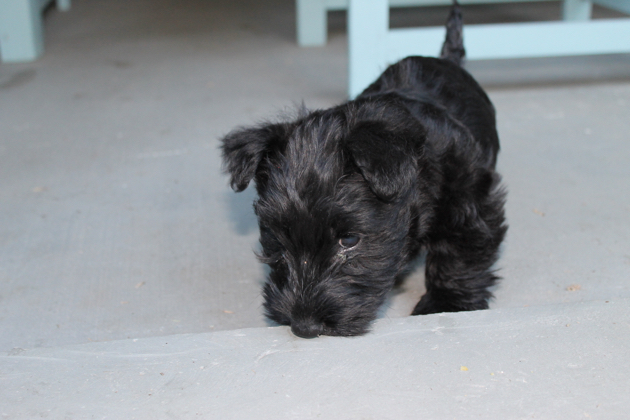 Gracie looks and sounds adorable; I'm sure she will be a welcome addition to your lives and to the blog. I've always wondered why veterinarians seem to think that humans can't safely feed dogs real food, and that processed formulas are the best and only way to feed them? It's not as if we humans ourselves eat kibble and canned food formulas. I go between commercial food and home cooking for our two big dogs, mostly because I have an older dog with severe food allergies and there is one commercial brand that doesn't bother him. Just beautiful! I love puppies tummies! Thank you for the dog food reviews. Quite an eye opener! We have decided to overhaul our cocker spaniels diet. He gets an itchy mouth after eating his biscuits which we thought were reasonable quality until I saw the list. I couldn't source Black Hawk in NZ so went with K9 after reading it's review. Of course the cat has an upgrade too as it would be unfair. Expensive but worth the long term health. Our dog totally refused to eat 2 brands of vet recommended dry food. Smarter than us I would say! What a cutie, I'd love a little puppy like her. Her name is beautiful too. Gracie is such a darling! I think you will all have years of happiness together! It is pretty awful what's put into commercial pet foods. We recently lost our dog of 12 years to pancreatic cancer. We tried to give her more time with us by changing her diet, but it was only a few days. Next time we get a dog we're not going to buy any of the commercial foods. Even the most promising new brands seem to go downhill pretty quickly. I just wanted to send you a thanks Rhonda for the prompt to look at our own dog food buying. We spend a fortune and prided ourselves on feeding our dog what we had been advised by vets as 'top quality' dried food. It turns out that according to the review website link, it only rates 2 stars! As we don't have the time to cook up food for our dog, the next best thing was for me to go through the list to find the 4/5 star rated ones for the future. am sure you & Hanno will have many years of pleasurable company & fun times! Oh she is so cute, I know she will give you lots of pleasure, and she will be well loved. Yes I think making her food is the best option. Darling doggie...keep us informed as to how training goes etc...cause we may get ourselves another doggie one day too...thanks! What a beauty Gracie is. I'm sure you're having a lot of fun with her. Just like human babies the night time crying snuggles with fur babies are the best thing ever. Thanks for the dog food recipe link I've been wanting to try making my own food for my Zeus and I can't wait to try your recipe. Enjoy that little ball of fluff, I know the 3 of you will have good times together. Congratulations on your newest family member. Gracie is so cute. I am a dog person and just love puppies. Thanks SJ. Of course I still love Airedales and always will but now we're older, Airedales are too big for us to handle. My step-son and DIL still have their two Airedales and we see them frequently. I know I wouldn't be able to control them on a lead if something were to happen while we're out and about. I love all square dogs and most of the terriers. We wanted a small dog with character, a dog I could pick up and wash in the laundry tub and a dog I could control when we're out. I've always had a soft spot for Scotties so when the time came to make a decision about a small dog, Scotties were the first dog that came to mind. We're lived with Gracie for less than a week and I'm totally in love with her. We made the right choice for us and I'm looking forward to many years with Gracie. Ahhhh !!! She is adorable!! I'm so excited for the many happy years to come with Gracie! I'm sure she will be an absolute delightful addition to your family ! What a cute puppy!!! My husband keeps reminding me that he would love to get a puppy. We have cats so I am not sure about that but it sure a pleasure to look at a sweet puppy!! Good luck Rhonda and Hanno with your little Gracie. She looks like she will bring you so much joy and what a lucky little pup to find a home with you two. ps Our lovely Golden Retriever, two next month, is also Gracie. She's a scallywag too! Thanks so much for this link. 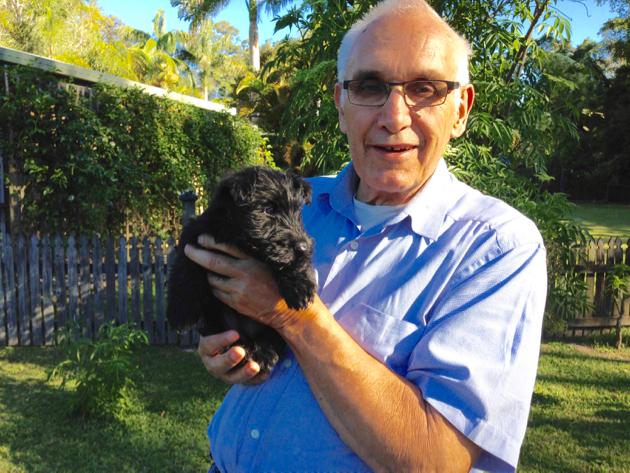 We have a new Schnoodle puppy (Schnauser X Poodle) and this was so helpful.